We don’t like to think of garbage. We move forward through life like slugs, leaving a trail of slimy debris behind us without looking back. Maybe it’s because we feel powerless to it all. We live on such a big Earth, with such big landfills, that are filling up so desperately quick. What can we do with our overflowing bags of accumulated nonsense except throw them into the bin, like contraband or a dead body, and shut the lid before the shame comes? What can we do with our rubbish, the parts of our lives we’d rather not see, when the business of sorting it is so… annoying? Thanks to two fearless Bardians, Roxanne Drewry (HAST, 2020) and Emma Sandman (HAST, 2019), we can feel a bit less schlecht about the things we throw away. When the call for civic engagement projects was sounded, they answered with a proposal for Prost to Compost. Their initial goal was to implement composting in the Bard cafeteria, to ensure that the food waste wasn’t wasted. They initially proposed this project to BCB’s Civic Engagement Coordinator Xenia Muth, only to find out that the cafeteria already composts. So they went back to the drawing board and relaunched Prost to Compost this year to include recycling, awareness campaigns, and an ambitious plan to bring composting to the Bard dorms. Last semester, their kickstarter week planted the “go green” seeds. Their goal was to inspire conscientiousness, to help us recognize our place in the ecosystem, and to set the stage for changes to come. The events varied, and though the winter weather was slowly creeping in, turnout was promising. During the environmental scavenger hunt, lists posted around campus and on social media prompted Bardians to search through bushes, barrels, and bottles. There was a screening of Planet Earth that brought us face to face with the cutest creatures ever and which helped remind us why this world is one worth saving [*1]. To top it off, we held a community clean-up day that included painting recycled birdhouses. All in all, the week left students feeling useful, excited, and — most importantly — aware. This semester, Roxanne and Emma are researching ways to bring composting to other campus buildings, like the dorms. But what’s composting, and why does it matter at all? Composting is a natural method of waste disposal wherein oxygen prompts decomposition in organic material. Most types of waste are compostable, including eggshells, feathers, coffee grinds, fruit peels, old jeans and whatever the Bard chefs dish out at mealtimes. The key is to separate organic waste from everything else and to store it in a separate, compost-friendly bin. 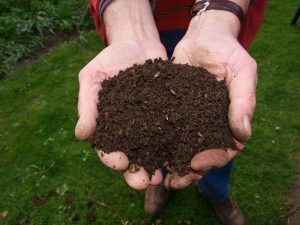 This organic matter need only be stirred every so often and, like magic, it will decompose into a nutrient-rich basis that grows other plants. As the saying goes: If a tree falls in the forest, and no one is around to hear it, the organic matter starts to rot, until it composts itself naturally and a new tree may thrive on the old tree’s bones. Some hippie-prone climates have a community compost bin, but in Berlin a third party agency collects the “Bio-Gut” for a fee. Roxanne and Emma are sorting through the bureaucracy of it now. They’re also recruiting volunteers to help move compost bins from inside to outside and for those interested to set spring projects in motion. Look out for a community garden when the weather gets warmer. If you’ve got any suggestions to help Bard go green, or if you’d like to volunteer to save us from our own trash-inflicted demise, contact Roxanne (roxanne.drewry@berlin.bard.edu) or Emma (emma.sandman@berlin.bard.edu). The film is absolutely beautiful and rated 9.4 on IMDB, if that means anything to you.